This weekend, I played a lot of Hearthstone: Heroes of Warcraft. My friend gave me a beta key, which was really nice of him. 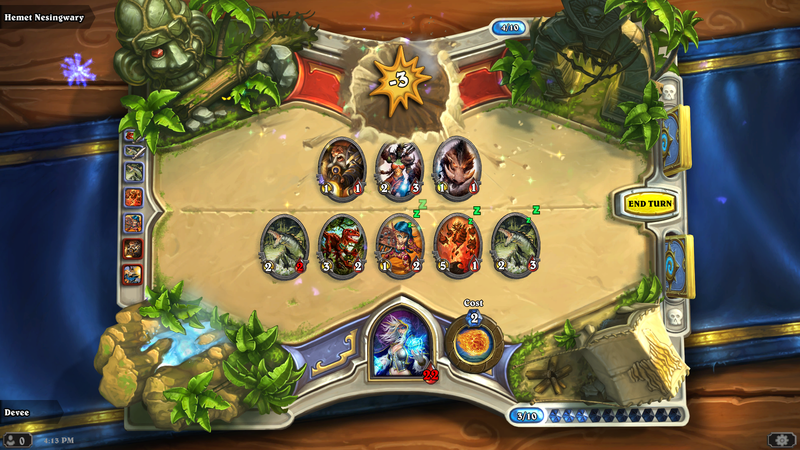 Hearthstone is a lot of fun. It’s very similar to other collectible card games, but at the same time, it’s a bit different. I feel like Blizzard must have put significant thought into what makes CCGs fun and makes them annoying. Having too much mana is annoying. Having too little mana in annoying. In Hearthstone, you use mana crystals, but they don’t come from cards. Like other games, your available mana is reset every turn. Your maximum is one on the first turn. On every subsequent turn, your maximum increases until it caps at ten. In this video, I’m playing a practice round against Malfurion. Hearthstone has three modes that I see – Play, Practice, and Arena. The play mode pits you against a similarly skilled player online with one of your constructed decks. I only tried one match of this, and I beat my opponent. Practice mode allows you to pick one of the classes for your hero and then pick your opponent. When you beat a class / character, you unlock it for your own use. I’ve unlocked all nine. As you play, you also gain experience and can level your heroes. When they level, you unlock additional basic cards. After unlocking all the heroes, you also unlock expert mode practice, but I haven’t tried it yet. The arena mode is particularly interesting. It’s a sort of draf. First, you pick one of three heroes. After that, you get to choose one of three cards thirty times to build your deck. You then play online with the deck, but after three losses the deck is retired. It’s pretty cool! I’m having a great time with Hearthstone: Heroes of Warcraft. I expect I’ll have more to say on it in the coming weeks as I keep playing.